Nobody wants a toothache, but they happen. When you get that pain, it’s pretty hard to ignore. It not only makes it difficult to chew your food, it can get so bad that it keeps you awake and gives you a headache. It is important to never ignore a toothache; your body is telling you in no uncertain terms that something is very wrong. We all know that our mouths are full of bacteria, which isn’t an issue as long as your gums and teeth stay healthy. However, if these features start to break down, the bacteria can get into them and cause devastating infections that may spread to your jaw and skull. Seeking treatment is very important. If you have a toothache, we have some great news for you: there are solutions. At Smile Designers, we pride ourselves on being the solution for people suffering from tooth pain. We act quickly to correctly diagnose what is going on so that we can move forward with treatment. It’s our goal to save your natural teeth and restore your comfort. When decay or bacteria get inside a tooth, the nerve and pulp become painfully infected. Without treatment, the infection can spread to the tissues surrounding the tooth. A root canal solves this issue by removing the nerve and pulp altogether. The clean tooth is then sealed so that it will no longer be a problem. You might wonder how your tooth will survive without its nerve, but the nerve only delivers hot and cold sensations. It isn’t required for the tooth to function on a daily basis. We are highly skilled at root canals and will get you on the road to recovery as quickly as possible. How do the nerve and pulp get damaged in the first place? There are several ways the inner part of a tooth can be negatively affected. 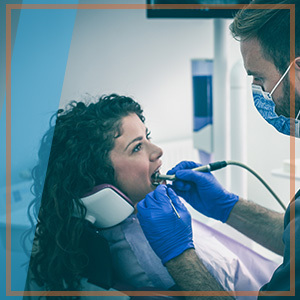 Neglect can lead to deep decay, repeated dental treatments can break the tooth down too much, a large filling can come loose, the tooth can be cracked, or you can suffer face trauma that damages a tooth. Life happens, and whether it’s a car accident or sports injury, your teeth can take part of the beating. If you or your child’s teeth have been damaged by any sort of trauma, we will bring all of our restorative and endodontic expertise to the table. We will evaluate the situation, clearly communicate our treatment solutions, and move forward with excellence to get everything back to normal as soon as possible. When your teeth have trouble, it can have a deep impact on your quality of life. After all, you need to be able to chew and smile! At Smile Designers, we have years of experience that empower us to provide world-class dental care. Let us help protect your teeth and repair them when they have trouble. We are here to serve you in Longmont, so contact us today for an appointment!